So, you have a surplus of stuff and you want to store it. Time to hit up the YellowPages, the internet, or your local newspaper to find your nearest storage outpost. About five minutes into your search, you’ll discover that not all storage spaces are created equal in terms of price, sizing, and amenities. When people are looking to store their belongings, it’s usually temperature sensitive goods that need to be handled with care, not tossed into the nearest garage. The climate can affect family heirlooms, documents, old furniture, and art causing them to degrade faster. You’ll also need to consider how accessible your storage unit is. Are you prepared to haul your king-size canopy bed all the way through a facility? Here are some points to keep in mind when selecting a temporary storage space. They’ll save you time, money, and a headache. This is one of the main considerations when choosing your storage space. When are you able to access your belongings? Are there designated “open” hours, or can you get to your unit any hour of the day, any day of the week? The best storage facilities give round-the-clock access to their customers. This means you won’t have to worry about the facility closing before you have a chance to get your moving truck there to drop off excess furniture during a move or have anyone asking you questions when you need to read Aunt Maisy’s letters one more time at 2 AM. You can discern a lot from a facility by the way that it’s maintained. Constant, thorough upkeep shows you the company is invested in running a proper operation and has enough staff on hand to make the building presentable. It also shows they’re diligent about monitoring their facility for signs of wear and tear, electrical degradation, and trespassers. Plus, you want to make sure your goods are being stored in a place that properly cleans their units before you move your belongings in. It’s good business practice and it shows that facility staff are examining every nook and cranny as they clean. A well-maintained facility is much easier to trust in than one that looks like it barely gets touched by a mop. Many belongings people store in temporary storage units are sensitive to heat, humidity, and air currents. This is why it’s essential to choose a storage facility that is adamant about its temperature control. Businesses don’t want to be held liable for ruining a customer’s items, nor do they want to face the anger and disappointment from the customers themselves. It’s industry standard to have temperature-controlled storage units. Antique books and artwork can be destroyed by an environment that isn’t conducive to their safe keeping. A good storage facility will have precise temperature control built into all their units, allowing you to keep even the most sensitive items in safe storage for years. It’s no surprise that storage units house valuable items. Usually, after an inheritance or a move, people are deluged with items that, although beautiful and worth a lot of money, just won’t fit in their current space. The concentration of valuables at a storage facility, coupled with the fact that these items are not checked on by their owners daily, makes storage spaces a prime target for robbers. Conscientious storage companies realize that their facilities are like a treasure trove for burglars and format their security system accordingly. There should be video monitoring all over the facility, security guards, and a knowledgeable admin person to take the name and information of every person who enters. A storage company that invests in security will attract more customers, allowing them to rest easy in the knowledge their valuables are well guarded. You may not think of temporary storage as a customer service industry, but it is. You, the customer, directly interact with company representatives to arrange your storage, receive your keys, and transfer your belongings into the space. Isn’t it more pleasant to be greeted warmly and be helped by someone who puts in their best effort? There can be a lot of confusion and sentiment around storing your belongings, especially if they mean a lot to you. Customer service reps should be empathetic to this and have answers to all your questions at the ready. Good customer service can mean the difference between just dropping your stuff off and feeling like your valuables are truly cared for. 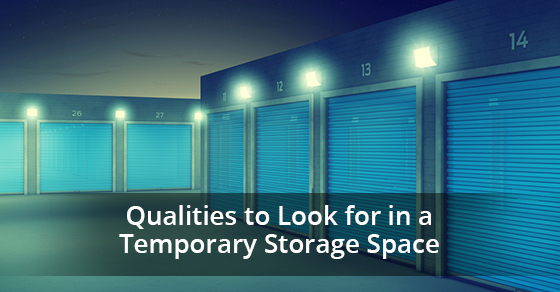 These are some basic qualities you should look for when considering temporary storage options. Don’t be afraid to reach out to the companies you’ve optioned and ask them about their accessibility, security, temperature control, and customer service policies. You should feel confident about entrusting the company with your family treasures, your furniture, and anything else that bears hanging onto. If you’re going through the effort of storing them, make sure you do it right. For more information about self-storage units, please call Jiffy Self-Storage at 416 74-JIFFY (54339) or contact us here.